So simple you can Do It Yourself Too! I like the fact that the previous owners "bricked" the whole back patio. It's nice and easy to care for. However, there is no color - no grass, no flowers, no nothing. That's what I'm working on this summer. Color. My first addition was to our gates. The gates are BORING. 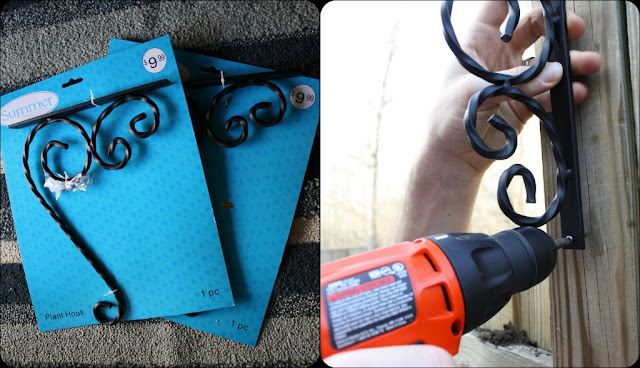 While at JoAnn Fabrics I picked up two plant hooks for about $10.20 for both of them. They were 40% off and I used my teacher discount. 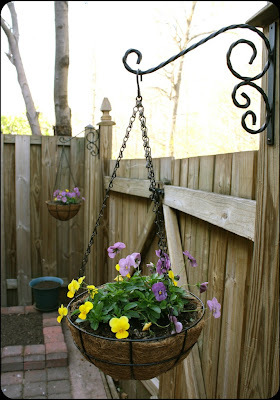 Then, while at Wal-Mart a few days later, I picked up two hanging planter baskets for about $4 for both. They were very cheap. Then, a few more days later I picked up some flowers at Lowe's. Kerry helped to put up the hooks on the gate ends. 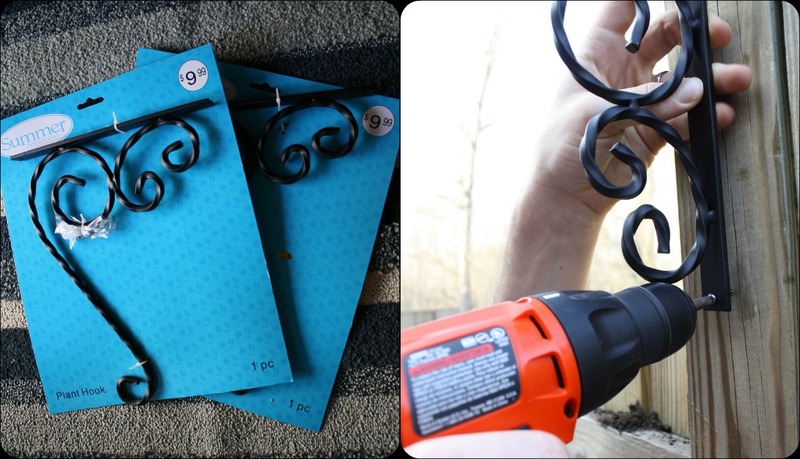 The plant hooks came with screws, so we used those. One screw head broke just as Kerry finished putting it in, but it didn't effect the sturdiness, so we let it go. The gates already look fancier with the hooks! The addition of the hanging baskets has already added some nice color to the patio. Next on the list: bright pots, hanging pots on the fence, and a raised flower bed. So much to do ! How do you add outside color to your home? Now you can Do It Yourself Too ! Welcome to Simply DIY2! My husband and I bought our first house in May (2011) and I am happily making changes (sometimes with Kerry's help) to make it into our own. I'll be sharing my experiences and projects as I go along. Hope you enjoy the blog and can use the ideas as inspiration to do it yourself too! Get Your Newspaper...Pots, That Is !